Are you building a legacy for the future? Or, are you being left in the dust? Today’s Grow Live addresses a key disconnect in the ways that sales and marketing departments embrace the digital era. Join Matt Johnson and Renia Carsillo as they discuss how industrial supply businesses can bridge the gap between traditional and digital sales and marketing. Check out their tips on how to compete in a digital world. “How do you differentiate your company from your competitors?” — Matt Johnson, CMO & Managing Partner at Spinstak Growth Agency. Today’s call to action: Have you transitioned some of your strategies from traditional to digital? Are you a nerd or ninja? Tell us in the comments below and we’ll send you some cool swag! Do you want to learn more about digital sales and marketing strategies? We’re here to help! Just reach out for a free consultation! Go to www.spinstak.com or call us at 866-270-0810. Don’t miss next week’s show! Join us for an exciting episode when we’ll discuss “How to Run a Sales Call like a Boss”. Are you living for legacy? In this week's episode of Grow Live, we're going to talk about bridging the gap between traditional and digital marketing. Tell us how you are building bridges in the comments below. We'd love to know about your traditional to digital strategies. Welcome back to Grow Live everybody. It's been a while since Matt and I have been in studio together so I'm excited to be back. Welcome back, Matt. Thanks. I honestly missed the show last week but you did a great job explaining to the audience how to maximize their Google presence and I thought that was an excellent episode. We're going to take it back to some basics here today so we're not going to dive into the technical issues as much because it's me here guys. So I'm going to keep it really simple for you today. Yeah. 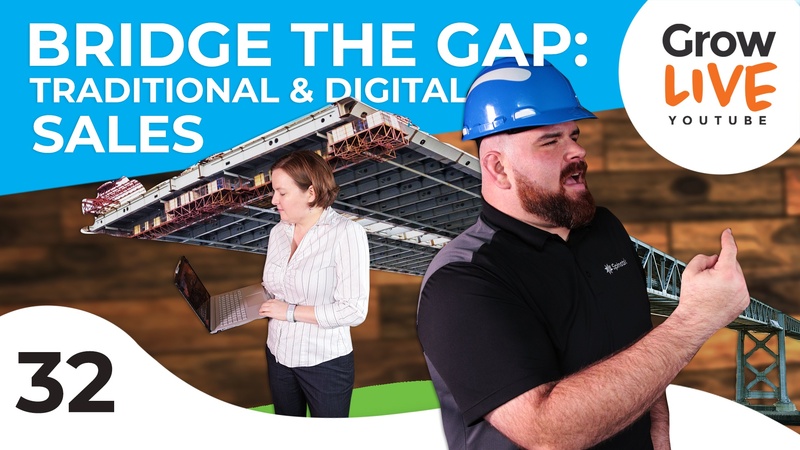 So today we're going to talk about bridging the gap between traditional and digital strategies and why that's so important for industrial suppliers. So if you're new to us, I'm Renia Carsillo, director of digital strategy here at Spinstak and I'm back again with Matt Johnson our CMO and managing partner and we're in episode 32, can you believe it? I can. It's amazing. This is exactly what we said that was going to happen and I'm excited for a bigger milestone like 50 or 100. It feels like we've done good but I want to hit like a big milestone. Awesome. So, while we're going through today we'd love it if in the comments below you tell us a little bit about how you are bridging the gap between your traditional marketing and sales strategies and digital strategies. We'd love to hear what's going on for you, what problems you're having or what opportunities you found and we love to hear about your wins. And remember, if you're not watching us live here on Facebook you can watch us in HD back on YouTube or listen to the podcast as well. And if you do leave a comment or leave a review we'll send you some swag to say thank you. Matt, you got some good swag for them this week? Well, you got these mugs and then you let us know if you're a ninja or a nerd and we'll send you a sweet shirt too. Very good, cool. So, let's kind of dive right in and let me just ask you the big question. What do you think is the current state of the industry when it comes to bridging this gap? This, Renia, we can honestly talk about this for hours. But we won't, we promise. Because this is like such a hot topic right now. So, industrial supply is going through a huge transition and it's mostly in part to, it's because of this thing called the Amazon effect. So we're going through a lot of digital disruption in our industry today. There are a lot of traditional distributors and suppliers who frankly are wading through a lot of confusion as it relates to how to go to market digitally and how to best position their brands and what their value proposition is. So a lot of companies are asking like foundational questions right now about why do we exist and how do we deliver value outside of the product is sold because those products are so readily available in so many different places now. So this is causing a lot of pain with a lot of companies. And so, the net result is an industry right now where you're seeing early adopters taking off and flourishing and you're seeing a huge group of companies who are frankly struggling and maybe looking to sell their business or otherwise get out of the game because they know that they can't adapt to the new buyer's journey. And why do you think that is because you said you're seeing these early adapters really starting to come out and flourish and show how well this can work for you and yet you're seeing a lot of hesitation for people to adapt to today's digital strategies. Why do you think that is? Honestly, it has a lot to do with people being stuck in their ways. We talk a lot about the idea of industries that have gone through similar disruption and there's countless examples. Just one of them as the idea of Blockbuster and you know how they were. They went through a horrible disruption because of Netflix and the streaming of video. A similar thing is happening here. The thing that put Blockbuster out of business is the thing that's putting a lot of smaller independent industrial distributors and even some not so small companies. And that is their inability to change. I would say it's not even because it's an inability but it's a reluctance or a desire to not change because they know that the change requires pain and they're not willing to go through the pain necessary to implement some of those changes. Yeah, I can understand that. I think anyone with a distribution model, any industry with a distribution model is feeling some of that pain right now. Like we see it in the car business, we see it in real estate. Where you're putting a middleman between the producer and the end user there's got to be some value to that middleman and that's what the digital experience is kind of disrupting. Absolutely. And so what we're seeing is more than ever before what distributors are having to do is they're having to clearly communicate their value proposition. If their value proposition was based on availability of product line, fast delivery, price, these are things where they're going to get killed and they are getting killed. And so, the issue now becomes how can you distinguish yourself from your competition and from the big box and from the Amazons of the world. How are you differentiating yourself. And if that's not made crystal clear to your existing customers and to future buyers, millennial buyers in particular, you're going to lose. That is what we're seeing today. That's why it's more important today than ever to have a social presence, to have consistent email marketing, to have a website experience and e-commerce capabilities that communicate what you're delivering aside from just the product. That makes perfect sense. It's a different world than I think a lot of these companies really came up in and that transition takes some time. It can take several years. Yeah, and what we're seeing is ... We work with a lot of companies that I would say are early adopters. It's crazy when you think about it because a lot of the world has been doing digital marketing for 10, 15 years and been doing it well and it's proven. However, our industry is sort of just now taking off. So we're seeing a lot of companies that we work with, they have the foresight to understand that if they want to be around in five or 10 years, they want to be relevant and prosperous, they have to make these changes now. And those are the companies that are going head and investing in the future because it's important for them to be relevant in the future. But some companies are not and frankly they're looking at how do we cut costs to the point where we can maybe talk about checking out or selling our business. I think you're either in one of those two categories. Yeah, that makes sense. So, you think that when you talk about this traditional to digital migration, you think the legacy of a company makes a big difference here. One of our values is living for legacy. The reason why that is, is because we specifically are looking for companies that value the same thing. So if you are being hit by this digital disruption that's happening and your inclination is to batten down the hatches and think about exiting the business or exiting the industry, we're not a good fit. On the flip side, there are companies and industry who are thinking about the future, who have, maybe they're family owned or maybe they're looking at passing on the business to their family or maybe they are looking at really, thinking of this as an opportunity and less like a threat and so they're realizing, oh man, look at all these competitors here who are struggling with this. I'm going to be the one who figures it out and I can take market share. Now those companies who are forward thinking, who are thinking about living for legacy and creating a culture and creating a business that stands the test of time, those are good fits and those are the companies that are going to be here 10, 15, 20 years from now. That makes perfect sense. It's not changing, it's not going away. I remember when I started in this industry in like 2008, the question that I got all the time was well, isn't this a fad, isn't it going away. It was a really hard sell in 2008 that it wasn't a fad, that it wasn't going away but I am hoping by 2018 we're all starting to kind of realize that it's not a fad. Our good friends at Modern Distribution Management put out another good report and it'll be coming out soon. I don't know if it's completely published yet. But, it is a report on distributor marketing, industrial distributor marketing. For the first time ever search marketing is the highest priority among high performing industrial distributors. And so, we're seeing is a realization at least on the part of industrial companies to understand we have to be going where our customers are going and that of course is the web to find solutions and products. Absolutely. So when you are out talking with one of these companies, let's say you're out on a sales call or you're out hitting some golf balls, what are you telling them to do to get started because I don't think most companies are coming to an agency in the beginning just to start off. What should they be doing first? Well, first and foremost is I believe and this is actually not my arena, I think this is your arena, Renia. I would say you have to start with looking at your existing technology stack and figuring out is your ERP software going to take you into the next decade or not. I would start there because that is actually the foundational software that's running your business. And then from there I would take a look at what am I doing in terms of my website. Do I have a good e-commerce website? Do I have a good website presence? Am I clearly communicating the story of my brand to my customers when they visit the website? Is it clear enough that a caveman understands it in the first five or 10 seconds of visiting the site? These are very simple things to do but things that I don't think a lot of companies are taking the time to properly invest in. I love that you said this because I actually want to low tech the beginning stages. I don't want someone's first move coming into the digital world to be to set up their Google My Business Profile or to set up a Facebook page because they're probably not ready for that yet, right? One of the most tragic things that I'll see come out with a company that hasn't done intentional planning to come into the digital space is a lot of not so great stuff that's hiding underneath the table. Maybe their team isn't ready to handle an influx of sales or maybe they've had some bad customer experiences that come out when you raise their search profile. So, building what that value proposition is and understanding it at your core, preparing your team for it and building out some brand building things, like brand guidelines and like you said about making sure your ERP can handle it, that your customer service and your sales team are trained up on new strategies. I think if you do those things first it makes the implementation a lot less difficult and a lot easier transition into the marketing space. It also allows you to get those quick wins because the marketing is a long game. It takes time to build momentum in digital marketing, in SEO or social media optimization, if you can get that sales enablement to your sales team, if you can get that customer service enablement, maybe using social media to your customer service team, you can get those quick wins while you're building your long term digital strategy. I agree. I don't think that you have to overhaul what you're doing to be successful and that's why we talk about tradigital marketing and really bridging the gap between what's worked in the past and what's working today and what's going to work tomorrow. So, I honestly don't think, believe me, nobody wants you to do inbound marketing and marketing automation more than us because we believe that is the future. That's what we believe is the way that customers want to engage with brands. However, maybe you're not ready for that. Maybe the first step is making sure that the website is mobile responsive and that it has a good product information and that it has a good user experience for your customers. And then after that, like how can you then support the website and what it's doing because your website's like a salesperson that is selling your brand while you sleep. If we can start there, I think we can really start to supplement it with some other basic marketing collateral like flyers. The industry report that I mentioned has in it is, that flyers and the print collateral is not dead, it works very well in our industry but customers want smaller more frequent pieces as opposed to larger less frequent pieces. 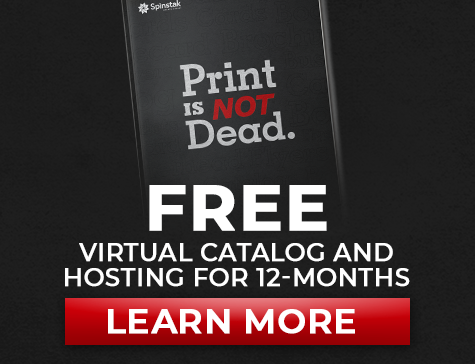 So, like putting a quarterly flyer program into place and implementing that alongside some basic email marketing so that you're staying in front of your customers and their inbox and couple that with a good looking website that performs well, I think you're well ahead of the game if you can do those few things and do it well. Yeah, and I think that's a great point. Starting small is usually the key to winning at this because it's really hard to keep up a huge just overhaul of the way you do business over time. You take one piece and you build some wins and you build on top of that and build on top of that, right? Awesome. One last thing that I would say and I know that we're going to push forward to wrapping this up but one of the things I would say is that consider investing in a digital consultant who can help you work through your existing processes so that you can figure out what happens when a customer places an order on the e-commerce website because the last thing you want to do is have your technology backfire for you. So make sure that you have a good experience all the way through fulfillment for your customer. So if they place an order, do they get an email notification that the order's been placed and received. Do they get an email when the order's been shipped out? Making sure the communication is good after the sale on the website is very important and making sure that you know how to fulfill orders, you know, just doing the basic blocking and tackling of using the website technology. These are things that may seem remedial to some of you because you figured it out and good for you because you're an early adopter but some of us, some companies have not gotten there yet and I would say that's the first place to start. Once you've mastered that let's talk about how we can get intelligent and how we can automate sales and marketing processes. Yeah, I love that. I think e-commerce is not very well understood a lot of the time and so if you can start with those foundational things, even things like understanding how something is shipped because there are products that might be great for your business to sell but they're not great e-commerce products because of shipping problems and things like that. So, understanding those areas of your business before you just dive in will save your employees a lot of pain and that will make it easier for you to move into the digital space. So I love that you said that. Now, when you think about, I know we talked a little bit about legacy earlier but to kind of wrap us up, I want you to kind of tell us what you think. Do you think this is optional? Do you think that people that are really interested in a long term business that's going to be around in 10, 20, 30 years, where do you think they need to be right now? I'm going to be pretty frank about this and it may ruffle some feathers out there but I'm okay with that. If you do not start investing in digital marketing yesterday or today, then I want you to do this for me. Go ahead and go through your financials and cut every existing cost out that doesn't need to be there because you should be preparing your business to sell because you're not going to be around in 10 years. I know that's maybe hard to stomach but the truth is that this digital disruption is only going to get worse. And so, your competitors are building out systems, I know because I'm working with some of them, they're building out systems that are going to engulf your customers. There's no way that you're going to be able to communicate your value proposition and deliver on what your competitors are going to be able to deliver in terms of a digital experience. You basically have two options, Renia. You either adapt and start investing and make budget for digital strategies or you start thinking about how you're going to exit. I would say those are your two options and I don't think there's really any place in between because this isn't an area where you dip your toe in either. You either say I'm going to become a digital distributor or I'm not. If you're not, who can buy your company and who can get you that check so that you can head to Jamaica. Yeah. I love that you said that because I think that's a legit strategy. No, I don't want to do all this. My game is to exit. I think that's okay too. You just need to know thyself. So Matt, if I'm interested in this and I like I want to figure out what the next steps are for my company, what should I do? So, if you're listening to this and you're saying I know I need to do something, I know I'm behind the times, you're thinking maybe it's too late. It may be, it may not. What I would suggest is let's talk about it. You can go to our website at spinstak.com schedule a completely free consultation and we will talk about this sort of thing. We'll talk about where you're at and what does adaptation look like for you? Do you have a long way to go? Do you have a short way to go? It may not be as bad as you think it is. I would be optimistic and I certainly would spend the time to investigate what it's going to take to make you relevant for the next five, 10, 15 years. Awesome. Sounds like a good plan. So, we again would love for you to leave us a comment letting us know what have you done recently to build your legacy by transitioning into the digital space. Let us know what your wins are or what comments you have and we will send you some great swag. If you missed any part of the show, you can watch it back on YouTube or listen to us wherever you get your podcasts. We like iTunes around here. But I'm really excited to have you join us next week, we're going to talk about a subject that I know Matt loves and will be near and dear to your sales team's heart, how to run a joint sales call like a boss. Yes. This is really exciting. If you have a supplier sales partner that you work with or on the flip side if you are a supplier sales team member and you have a distributor that you like to work with, bring them together, let's have lunch together next week, we're going to have a great conversation about running a joint sales call and how to wow your customer with that process. Awesome, I'm excited. We'll see all y'all next week. All y'all, my southern came out. All y'all. See all y'all later. Hey, and don't forget that you can see us live on Facebook every Wednesday at noon or you can find us on YouTube and binge past episodes in full HD.